1930 was the Year of the Hitter, as the National League batted an incredible .303, and the American League wasn't far behind at .288. Athletics ace Lefty Grove barely noticed, though, pacing the AL with a 2.54 ERA while racking up a 28-5 record. Philly's No. 2 starter, right-hander George Earnshaw, went 22-13 despite a 4.44 ERA. St. Louis featured solid pitching, but the Cards' biggest winner during the regular season, Wild Bill Hallahan, won only 15 games. The World Series opened in Philadelphia, with Grove facing Cardinal spitballer Burleigh Grimes. 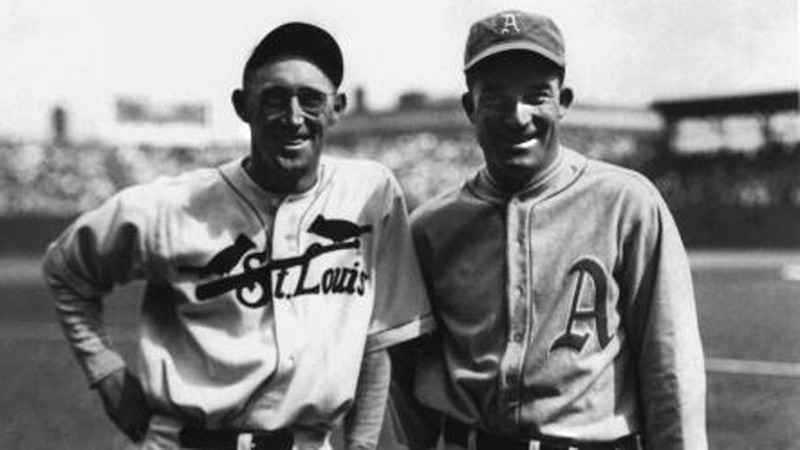 St. Louis grabbed a 2-1 lead in the third inning, but Grove held the Cardinals scoreless from there, as Al Simmons and Mickey Cochrane smashed solo home runs, and the Athletics cruised to a 5-2 victory. In Game 2, Earnshaw limited the Redbirds to six hits and one run. Philly scored two runs apiece in the first, third and fourth innings, all off Cardinal starter Flint Rhem, and the contest ended at 6-1. After a day off for travel, the Series resumed in St. Louis, where the home team found new life. Hallahan tossed a seven-hit shutout in Game 3 to beat the Athletics 5-0. In Game 4, knuckleballer Jesse Haines outdueled Grove, 3-1. The Cardinals scored two unearned runs in the fourth, thanks to third baseman Jimmy Dykes' throwing error. Game 5 matched Earnshaw against Grimes, and after eight innings there still was no score. Mickey Cochrane led off the top of the ninth with a walk, and after Al Simmons flied out, Jimmie Foxx smashed a two-run homer deep into the left-field bleachers. That was the game, as Grove gained the 2-0 decision with two innings of scoreless relief. Back in Philadelphia, Earnshaw drew the starting assignment for Game 6, despite having pitched seven innings just two days earlier. He responded with a complete-game five-hitter, holding the Cardinals scoreless until the ninth. Meanwhile, the Athletics hitters rapped seven extra-base hits on their way to seven runs. The final was 7-1, and Philadelphia had its second straight World Series.